John Matthew Devine lead many different battalions to in World War II. This list of battalions consists of the 90th infantry, 2nd armored division, and the 8th armored division. The 8th armored division is what he is best known for. There he fought in the Battle of the Bulge, which was considered to be Hitler's last stand. He was hand selected by President Eisenhower to lead the 8TH armored division. With the 8th armored division he fought in the heart of Europe where he help propel the allies to victory. In this paper i will be focusing on General Devine's accomplishments with 90th infantry. John Matthew Devine lead the 90th as Brig General of Artillery in April 5 1944. He believed leadership in small groups played a large role into his success. He fought in Normandy. The whole 90th division consisted of 19200 people, which is one of the biggest divisions in World War II. The 90th infantry was one of the toughest divisions, they had several nicknames such as the "Alamo Division" or the "Tough Hombres". The 90th infantry was sent over seas April 4 1944 then fought their first battle in June 9 1944.! 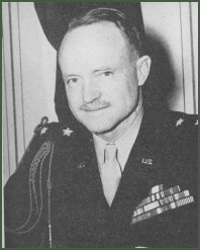 General Devine took over his position as brigadier general on April 5 1944. As head of artillery, his main job was to give fire support. He fought along side general James M Gavin in some of the battles. During the battles he was able to provide artillery support while fighting The 90th infantry artillery battalion was part of the ETO, which means General Devine's company was the only artillery company in his whole division. He was the commander of the sole artillery company in his division, which gave him a large responsibility. John Matthew Devine is one of the many forgotten generals in World War II.